A lot of people have been shocked by Donald Trump's refusal to confirm that he would accept the results if Hillary Clinton wins the election. Actually, his reaction to the outcome is not that important. What will be more important is the reaction of his supporters. Mr. Trump has sown the seeds of anarchy with his unsubstantiated allegations that the election is rigged. Many of those seeds have not landed on fertile ground. A fresh poll by Politico has found that only 14% of voters and 24% of Trump's supporters think he should challenge the election results if he loses. But 46% feel it's likely there will be widespread voter fraud. What accounts for this? One explanation may be that a segment of the population has been fed on a diet of conspiracy theories by the "entrepreneurs of outrage", as The Economist calls the Limbaughs and Aileses who have become rich by monetizing paranoia and anger. However, I'm guessing there is a deeper and more important message at the core of the entire campaign season. There are a lot of Americans who want to see a revolt against an economic system they feel is rigged against them. They feel that the rigged economy is sustained by a rigged political system controlled by the oligarchs among us. It makes some sense in that context that an election might be rigged, too. The only evidence of election rigging is coming from the Kremlin. But there is evidence that shows something else: the deep unrest among Americans who have reason to feel there too little opportunity in our opportunity society. There is every indication that our democracy has become an oligarchy. It is not the country we are promised in our social contract. There's no guarantee that we will all become rich and achieve the American Dream, but there is supposed to be a guarantee that we each have the opportunity. It may be that the principal complaint against the economy is not its slow recovery, but its fundamental injustice. We are the nation that imprisons more people than any other, but we are also the nation where mismanaged banks are too big to fail and corporate CEOs are too rich to jail. The latest of many examples is Wells Fargo CEO John Stumpf, whose company apparently defrauded millions of its customers. Stumpf resigned and walked away with $134 million, with no sign yet that he will face any charges. In 2014, the pay gap between CEOs and the median salaries of the people who worked for them was 204 to 1, according to Glassdoor Economic Research which tracks trends in the labor market. There is something egregiously unjust in that. The fine print in the social contract says that those who accumulate wealth will reinvest in the economy with more capital investment, higher pay and more jobs. 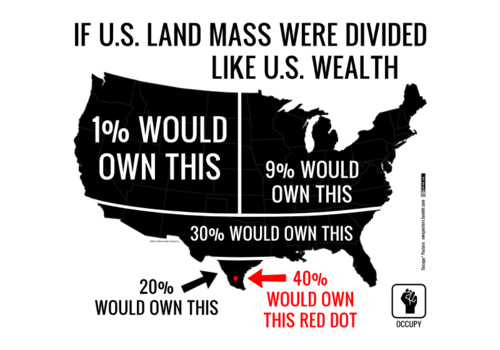 But much of the wealth in America is being horded. In 2013, a study by Bank of America found that more than half of America's millionaires had substantial amounts of cash on hand and 60% said they did not plan to invest it. Oxfam America found this past April that the 50 largest U.S. companies had stashed more than $1.4 trillion in cash offshore and used more than 1,600 subsidiaries as tax havens to avoid billions of dollars in taxes each year. Corporate tax dodging is estimated at $100 billion annually, "a gap that the average American taxpayer would have to shell out an extra $760 to cover", Oxfam calculated. Citizens for Tax Justice reported last March that Fortune 500 companies are avoiding nearly $700 billion in federal income taxes by holding $2.4 trillion offshore. The Pew Research Center reports that people earning more than $250,000 annually pay about half of the nation's federal tax revenues, more than many people think. But Pew also confirmed that corporations "employ battalions of tax lawyers to find ways to reduce their tax bills from running income through subsidiaries in low-tax foreign countries to moving overseas entirely." For several years now, wealthy entrepreneur Nick Hanauer has warned his "fellow zillionaires" that there is trouble ahead if the income gap is not narrowed. "I have a message for my fellow filthy rich, for all of us who live in our gated bubble worlds," Hanauer has written. "Wake up, people. It won't last. If we don't do something to fix the glaring inequities in this economy, the pitchforks are going to come for us. No society can sustain this kind of rising inequality." In my view, the American dream of striking it rich is merely a well-marketed fantasy that keeps the bottom 99.5% hoping for better and prevents social and political instability. The odds of getting into that top 0.5% are very slim and the door is kept firmly shut by those within it... A highly complex and largely discrete set of laws and exemptions from laws has been put in place by those in the uppermost reaches of the U.S. financial system. It allows them to protect and increase their wealth and significantly affect the U.S. political and legislative processes. They have real power and real wealth. Ordinary citizens in the bottom 99.9% are largely not aware of these systems, do not understand how they work, are unlikely to participate in them, and have little likelihood of entering the top 0.5%, much less the top 0.1%. Moreover, those at the very top have no incentive whatsoever for revealing or changing the rules. "The way to avoid class warfare is class compassion," I wrote then. "We need transparent fairness in our tax and political systems, a sense of social responsibility by those most blessed with wealth, and compassion for those who want to work for their share of the American Dream, but cannot." In an insightful article published by Mother Jones, writer Arlie Russell Hochschild tells what he learned while spending five years with tea party supporters in Louisiana, the nation's third poorest state. He found "a story of unfairness and anxiety, stagnation and slippage" where people were in deep need of help but were ashamed to admit it. "Not only does (Trump) speak to the white working class' grievances," Hochschild wrote. "As they see it, he has finally stopped their story from being politically suppressed." We are living in an age that is the product of austerity measures, deregulation, skyrocketing student-loan debt, high unemployment and a lack of affordable housing. Many of us cannot remember a time when the U.S. was not dropping bombs on the Middle East. Democratic socialism sounds like a much better alternative than our current system. So when a disheveled old white dude comes along and says our society is rigged for the rich, perpetual warfare is not the answer, and people of color should not be slaughtered by the police--and then asks for our help and a few dollars to bring about a revolution--you're damn right we're going to stand with him. The challenge Hillary Clinton still has to overcome is the perception that as a career politician and a friend of Wall Street, she is more likely to sustain this status quo than to upend it. The irony is that after 30 years of public service, she has arrived at the top of the political ladder at precisely the time many Americans do not trust politics. She could appoint Elizabeth Warren as our next Attorney General, with a mandate to be the pit bull who holds Wall Street accountable. She could go on the warpath against fossil energy subsidies with a much more aggressive campaign than we've seen so far. But more than that, she should commit to reinvest the $20 billion in annual tax breaks for oil, gas and coal. The money could be redirected to the national infrastructure bank she has proposed to create jobs to modernize our critical energy systems. She could go to the mat for funds to reclaim the estimated 500,000 abandoned mines that pose risks of accidents and injuries as well as soil and water contamination. She could focus on the reclamation of abandoned coal mines, creating jobs for displaced coal minors. Millions of Americans live within a mile of these mines and the health and safety risks they pose. She could launch a national campaign to create jobs by restoring other damaged ecosystems that we have degraded or destroyed including those that protect communities from floods, help purify the air to prevent childhood asthma, or that are vital to the outdoor recreation industry. In my estimation, this election has never been about the popularity of Donald Trump. For some of his supporters, it has been about the fear that the government will confiscate their guns, or that the United Nations is plotting to take over the world, or that America's white majority is being lost to non-white immigrants, or any number of other conspiracy theories they are being fed. But it also has been the about legitimate desire of an economically suppressed segment of society to find a leader who will shake up the system that is rigged against them. One of the other ironies of the 2016 election is that they chose one of the plutocrats to be their champion.